The four-star hotel, Danubius Helath Spa Resort Buk, is an oasis of well-being, standing apart from the the busy world, treating body and soul with all the best that nature has to offer. 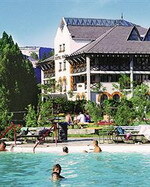 The famous Spa of Buk is located in a spacious green area, in Western Hungary, 25 kms from the Austrian border. The hotel offers both modern well-being, and traditional therapeutic services, based on the healing effect of the local thermal water. Spa facilities: indoor thermal bath, indoor swimming pool, outdoor pool, partially indoor, partially outdoor fun bath, sauna, solarium and steam bath. Therapeutic facilities and services: specialist doctor's examination and consultation, eye-examination, dental clinic, packs with Heviz mud, balneo- and hydrotherapy, electrotherapy, physiotherapy. Wellness and Fitness services: thalasso therapy, aroma therapy, revitalizing and relaxing massages, antistress programs, Danubius Premier Fitness room, tennis, squash, minigolf, table tennis, garden chess, bowling, billiard, petanque, bike rental, sport animation, and gymnastic programs. The 5-star Radisson SAS Birdland Resort & Spa in Bükfürdo offers exclusive wellness services, fine cuisine and rooms overlooking either the golf course or the beautiful surroundings. All rooms are elegantly furnished and designed in 3 different styles, some rooms also provide a balcony. The 2 restaurants of the Radisson SAS Birdland Resort and Spa are the à-la-carte Laguna Mediterranean-style restaurant and the Seasons restaurant with a welcoming terrace overlooking the gorgeous golf course. The rich and healthy buffet breakfast, providing you amongst others with a diabetes food corner and freshly squeezed fruit juices is the perfect start of your day. End your day with a visit in the cosy Piano Bar and enjoy a wide selection of tea, coffee and chocolate specialities, exclusive wines as well as vitamin and milk shakes. Enjoy beauty treatments with luxury cosmetic products, Ayurvedic and Thai massages and relax in the 3500 m² spa and sauna world with 6 pools, 8 saunas as well sunbathing and state-of-the-art fitness areas. Refreshing juices as well as light meals are available at the wellness bar, which is a popular meeting place throughout the day. Debrecen is not only the second biggest town in Hungary but also the cultural, religious, economic and tourist centre of the territory east of the river Tisza. It is also referred to as the „Eastern Capital” of Hungary. Hunguest Hotel Nagyerdõ is situated in the green heart of Nagyerdõ, the most beautiful part of the town in idyllic and peaceful surroundings. There are two air-condotoined restaurants and a lobby bar in the hotel. In the summertime an exclusive Grill-garden in the inner park of the hotel awaits the guests with specialities prepared on charcoal as well as in cauldron. The air-conditioned restaurant provides buffet breakfast and main meal a'la carte as well as in a menu system. For guests the indoor bath of the hotel filled with thermal water (6x6 m) is free of charge. 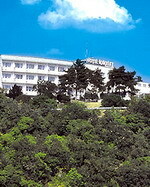 The hotel hosts an own medical wing, where the following services are available for guests: medical examinations, massage (medical, refreshing), underwater jet massage, carbon dioxide bath, mud pack, electrotherapy (iontophoresis, diadynamic current, interference, TENS treatments, ultra wave treatments, magnetic therapy), inhalation. Whether you come to Eger for business or pleasure, this property offers a friendly atmosphere and makes your stay a pleasant one. 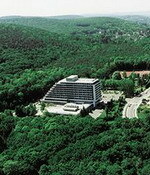 Nestled on the south side of Bukk Mountains, the Hunguest Hotel Flora is just a short walk from the Eger Town Centre. This property boasts 184 guestrooms that are equipped with all the essential amenities to ensure you utmost ease and luxury. The on-site restaurant serves Hungarian and international specialities for you to feast on. The hotel offers a wellness centre, which includes a well-equipped gymnasium, sauna, swimming pool, jacuzzi, massage service and aromatherapy for your mental as well as physical well being. You can also indulge in the game of tennis or billiards, which are available on-site. 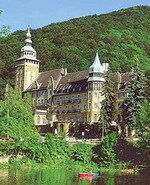 Hunguest Hotel Palota ('Hotel Palace') is situated in Lillafüred, a settlement 10 km-s far from Miskolc (approx. 200 kms from Budapest). The city surrounded by three mountains lies in a picturesque valley in the eastern part of the Bükk mountains. Lillafüred is one of the nicest resorts in Hungary. The castle built in neo-renaissance style between 1927 and 1930 is surrounded by a hanging garden and large park. The view to the Szinva stream and the Hámori Lake is made even more magnificent by the murmur of the Szinva stream waterfall in the direct neighbourhood of the hotel. In frames of the complete reconstruction of the hotel, rooms were reconstructed in a stlye that fits the building. The hotel has 129 rooms among which 95 are double-, 16 are single rooms and 18 suites. The unique suite-like rooms with a round-view in the small tower are especially convenient for romantic guests and those on honeymoon. 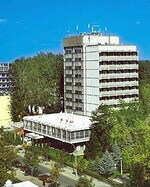 Galyateto lies at the second highest point of the Mátra Mountains at 956 meters above sea level, but Grandhotel Galya is the highest-situated hotel in Hungary. 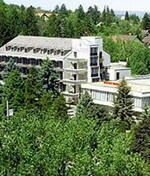 This newly refurbished all-season wellness and conference hotel offers you up-to-date facilities surrounded by fresh mountain air and a mild sub-alpine climate. The yearly hours of sunshine are above the national average at this scenic place. 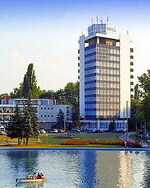 Grandhotel Galya was built from 1937 to 39 in the middle of a lovely, 5-acre park surrounded by forests, providing ideal conditions for relaxing walks. At the very Baroque centre of Gyor, "the meeting place" for locals. For a rich cultural experience, take a break at Hotel Rába. Savour more than 25 sorts of Belgian beer while enjoying the early-20th-century atmosphere in the Royal Belgian Beer Café. Book a suite for maximum relaxation during a longer stay. Pets are welcome. 134 rooms and 21 suites with bath, hairdryer, telephone, minibar, TV, internet access. All suites with air-conditioning, spacious bathroom and separate work/study room. Smoking rooms and rooms for disabled. Sauna, solarium, massages. Rent-a-bike, water sports facilities. 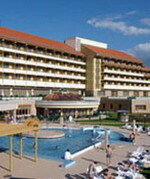 Near by: thermal, spa and adventure bath of Gyor. Restaurant, Belgian Beer Café Royal (Belgian restaurant and pub) with Hungarian and international cuisine and wide choice of Belgian beer, night bar. Hunguest Hotel Erkel hosts guests in the Castle Garden, next to the boating lake and the Castle, in a friendly atmosphere, with favourable rates. Via a covered corridor, the Castle Baths can be accessed directly from the hotel. Gyula, this historical bathing town rich in monuments, is situated in the southeastern part of Hungary, by the Hungarian–Romanian national border. Its history goes back to the 14th century. The town accommodated the only surviving, Gothic brick castle of Central Europe, erected in flatlands back in the 15th century, which in the summer hosts theatric performances. Being deservedly famous for its medicinal waters, the four-star Castle Baths offer medicinal and adventure pools to guests alongside with a water paradise for children, a wave pool, giant and kamikaze shoots, as well as a competition pool that can also be used in wintertime. The wellness center awaits the guests preferring relaxation and healthy lifestyle with adventure pools, sauna and steam cabins. Located in the most popular spa resort on the Great Plain, the Hunguest Hotel Hoeforras is home to a rheumatism clinic and provides various thermal water treatments that are well known in this Hungarian town, Hajdúszoboszló. Just 20 km west of Debrecen, Hungary's second largest city, Hajdúszoboszló is famous for its medicinal baths. Thermal waters were discovered in Hajdúszoboszló in 1926, and the town has since become known as the "mecca of medicinal healing" within Hungary. A new modern medicinal bath centre was built here in 1999, and additional treatments facilities include saunas, massage rooms, underwater jet massage and underwater physiotherapy. The Hunguest Hotel Hoeforras located in Hajdúszoboszló is three hours from Budapest by car or train. 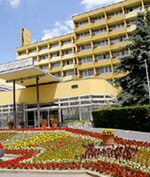 Other hotel services and amenities include indoor thermal pool, sauna, solarium, Jacuzzi, lobby bar, room service, summertime food service in the hotel garden, outdoor children's pool and playground, adult outdoor pool and thermal spring, gift shop, secured parking lot and business services..
Renovated in 2006, the hotel consists of a 6-storey main building (Anna) and a 2-storey neighbouring building with a total of 210 rooms (including 12 suites) as well as a terrace and a garden. The two buildings are connected by a heated tunnel and each afford their own unique ambience. The lobby offers a 24-hour reception, a hotel safe and lifts. Additional facilities of this air-conditioned hotel include a bar, a cafÚ, shops, a bar and a restaurant with highchairs available for children. Moreover, guests may make use of the conference room and the public Internet connection with W-LAN access. Medical services are also available. In addition, bicycle rental, a bicycle storage room, a children's playground and car parking is also available. The world-famous thermal lake of Hévíz with its thermal springs is the largest body of water in Europe and offers visitors open-air bathing the whole year round. . The Hunguest Hotel Panorama awaits the guests who are looking for health cure and recreation all the year in the proximate neighbourhood (only 100 meters) of the world-famous thermal lake of Spa Heviz. Our hotel is located in the center of the town, the Pedestrian Street, Cinema, Museum, Thermal Lake, Saint Andreas Hospital & Medical Center, and the Bus-station can be found only 200 m from the house. The thirteen-storey building was totally renovated in 2002, here can be found the Classic and Superior rooms which are totally suiting the requirements of present-day (rooms are equipped with TV, phone, minibar, balcony, bathroom). 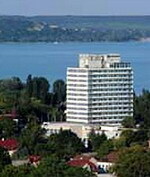 From the top floors is an impressive view and panorma to the town, to the thermal lake and Hills of Keszthely. Hunguest Hotel Ezüstpart is a modern hotel with 800 meters of private beach located on the banks of Lake Balaton in the spa resort of Siófok. The hotel offers simply decorated guestrooms with dark wood furnishings; all feature minibars, cable television and telephones. Most rooms have balconies. Guests can dine à la carte in the air-conditioned lightly colored restaurant throughout the year. Hungarian and international dishes are offered and vegetarian and children's menus are available. During summer an additional restaurant is open. The Espresso Bar is a terraced bar with live music, and a brasserie with two bowling alleys. Guests can pamper themselves with hydrotherapy, massage and beauty therapies. Guests can also relax with a dip in the indoor swimming pool or a trip to the sauna, solarium or library. Internet access is available on request, while guests arriving by car benefit from parking (fee) and a car washing service. 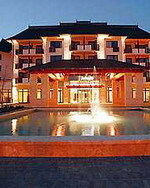 The Ramada Hotel Resort Lake Balaton is 500 meters from the Balatonalmadi Marina overlooking Lake Balaton and 5 kilometers from the vineyards of Balatonalmadi, Hungary. The Veszprem Castle District is 12 kilometers from the hotel and Balatonfured Marina is 15 kilometers away. The hotel offers airport transportation to Budapest Ferihegy International Airport for a fee. On site dining options include international breakfast and dinner buffets at Sirocco and fresh seafood and wine for dinner at Levante. The Mistral Bar serves international cuisine and specialty cocktails in a casual inside atmosphere or on the terrace with live nightly entertainment. The lobby bar serves light fare and spirits. Conference and event rooms are accessible throughout the hotel. Several recreational amenities at the resort include spa services with a steam room, a spa tub and a sauna. The hotel hosts an indoor pool, a hair salon and a fitness center featuring cardiovascular equipment and racquetball courts. 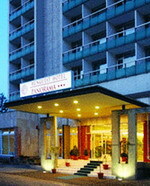 Hunguest Hotel Palota ('Hotel Palace') is situated in Lillafüred, a settlement 10 km-s far from Miskolc (approx. 200 kms from Budapest). The city surrounded by three mountains lies in a picturesque valley in the eastern part of the Bükk mountains. Lillafüred is one of the nicest resorts in Hungary. The castle built in neo-renaissance style between 1927 and 1930 is surrounded by a hanging garden and large park. The view to the Szinva stream and the Hámori Lake is made even more magnificent by the murmur of the Szinva stream waterfall in the direct neighbourhood of the hotel. In frames of the complete reconstruction of the hotel, rooms were reconstructed in a stlye that fits the building. The hotel has 129 rooms among which 95 are double, 16 are single rooms and 18 suites. The unique suite-like rooms with a round-view in the small tower are especially convenient for romantic guests and those on honeymoon. The hotel is located at one of the most scenic spots of the Mecsek Mountains, directly above the downtown of Pécs. 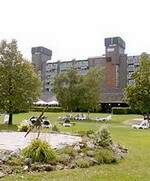 The hotel offers a unique view onto the town and the neighbouring hills. From Budapest the town can be reached on the main route 6 within 3 hours. Pécs is located in the southern part of the Mecsek Mountains with a Mediterranean climate. The town is famous for its relics of the past. The more than 2000 years old town is the home of arts and culture and is famous for its museums as well as for its artistic life. It is also referred to as the region of grapes and wine. 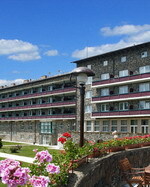 In the three-storey building that was completely renovated in 1998 and is a listed building 33 double rooms are available, 2 suites with a view to the forests of the Mecsek, 9 superior rooms with balcony, with a view to the town, 22 standard rooms with a view either to the town or the forest. The modern Hunguest Hotel Maroni is set at the foot of the Sopron Hills, surrounded by stunning countryside, located ten kilometers from the Neusiedler See National Park. The 87 guestrooms have dark polished wooden furniture set against simple light decor. Rooms include balconies and are complete with bathrooms with handheld shower/bathtub combos and hair dryers. All are equipped with cable TV, minibars and telephones. Guests can play a few games at the bowling alley, rent bicycles to explore the stunning countryside and enjoy complimentary use of the nearby fitness center. The restaurant serves Hungarian and international cuisine in modern surroundings and can seat up to 350 people and the Maroni Cafe serves drinks and snacks in the outside courtyard. Business guests can make use of the naturally lit conference rooms and children can enjoy the onsite playground. Guests are just ten kilometers from the Austrian border and the Neusiedler See National Park, a haven for bird watchers and hikers. 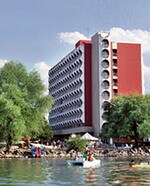 The hotel is located in the midst of a park, 15 minutes from the city center in a green hilly area. 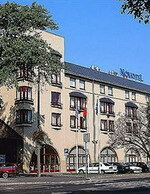 The hotel was renovated in 1998. The rooms, the floors, the staircases have been renewed and refurbished, too. 52 rooms are completely renewed, the other rooms have been partly renovated. Non-smoking rooms on request. In the hotel restaurant your can have different meals a la carte. In the morning you will find a rich breakfast buffet. The hotel offers 6 clay tennis courts in the garden of the hotel. Hunguest Hotel Forras, the spa and wellness hotel in Szeged, is on the eve of renewal! 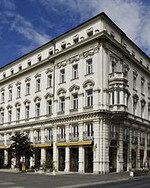 Due to renovation works to be started in autumn 2008 the hotel will have a totally new external and internal image and await its old and new guests with four-star rooms and services probably as from the summer season in 2009. According to our plans full-fledged renovation will take place in the hotel rooms, conference and special event halls as well as catering units. Therefore, the hotel will not be open expectably between 15 September 2008 and December 2009. Planned new services include the following: luxurious apartments with Jacuzzi and fireplace, direct access to the neighboring spa to be renovated too, conference halls for 450 and 150 participants, a restaurant for 400 guests, bowling facility, X-box room and an underground garage. 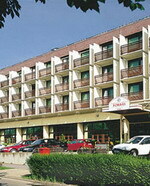 The Novotel Szeged is a 4 star hotel located in the centre of Szeged on the bank of the Tisza River. Spend your next holiday discovering this beautiful city and stay at the Novotel, close to the Ferenc Mora Museum and the Votive Church. There is plenty for the family to enjoy as well with a variety of sports and entertainment in and around the city. The hotel features a restaurant, bar and meeting rooms as well as WiFi internet and onsite parking for your convenience. 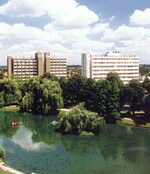 Szekesfehervar is the "The City of Royals", rich in cultural and historical sights. 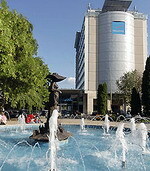 Whether in city center or near to the station or airport, Novotel hotels are ideally situated in SzekesfehervarNovotel offers a 24-hour reception with a buffet breakfast, Wi-Fi, a large room with a bathtub and a sofa bed for children, who stay for free in their parents' room if they are under 16. With its extensive experience, Novotel has developed real expertise in organizing meetings and hiring meeting rooms in Szekesfehervar: High-speed wireless Internet, presentation equipment, coordination of breaks, fully-equipped room. Tapolca, a town famous for its caves and streams, is situated in the west part of the Balaton highlands. Below the hotel there is a karst cave, which is not only a beautiful sight, but also offers a special microclimate and curative treatment. Hunguest Hotel Pelion is situated in the city centre, in a 4-ha-large park, directly above the cave ideal for curing respiratory diseases. Unique in Europe is the direct connection between our hotel and the grotto. The restaurant offers Hungarian, international and "bio" dishes. Room service around the clock. In the lobby bar you will find a wide range of coffees and drinks, with music in the evenings. In summertime grill terrace and pool bar are also available.